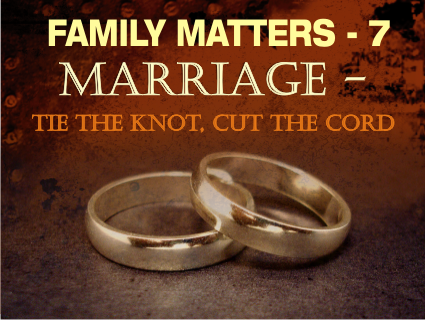 WordOfGraceChurch: Family Matters 7 Marriage - tie the knot, cut the cord. Family Matters 7 Marriage - tie the knot, cut the cord. This is part 7 of a series called Family Matters. What is marriage? What is the blue print for a good marriage? We are sorry that there is no audio to go with this blog. Marriage is a very touchy topic - Anything that touches our core values or our culture can be a sensitive issue. In every culture there are some things that are good. We have such beauty and variety in our India dress, colors, styles of cooking. In general, Indians are warm and hospitable - whether rich or poor. But sometimes, there are things that are not good and there are things that are neutral viz. dress, food. There are things that are wrong that have been needed to be addressed and removed viz. Sati, dowry, and child marriage. Bad things need to be rejected. Some things need to be redeemed. The Good News of the Bible upholds good things and redeems certain things in our culture. Marriage is God’s idea and not one cave man who decided to stick with one woman. Marriage is not just a good thing, it is a God thing. God gave man a mission to look after the garden. He then gave him a Mrs. and we have the first marriage. Marriage is also a mystery. The Bible begins with marriage and ends with the marriage supper of the Lamb. Q. what is God’s blueprint for marriage? Statistics show that marriage is on the decline and the rate of divorce is going up. In Mumbai there are 250 cases monthly registered for divorce. There are many more broken marriages where the wife will just bear up and suffer. n Genesis 2:24-25- God lays down the foundation here. This is important because the very foundation is being attacked, marred and disfigured. God wants us to uphold His divine pattern for marriage. This is the divine recipe for success in marraige. The ingredients and the method, both are important, just like in a recipe. This is God’s blueprint not man’s clever idea. It is repeated again in the New Testament in Matthew 19:4, Mark 10:7 and Ephesians 5:25. We are going to talk about the first one today and that is ‘leaving’. Then we have joining. It means being superglued together so strongly, that separating the two will result in damaging both. Becoming one flesh is a mystery. As a man an woman come together in marriage, it is God who joins them and makes them one flesh. Finally, "named and unashamed" speaks of intimacy. This refers to mental, emotional, physical and spiritual oneness. · Physically: not necessarily living in the same house under the same roof. How do we do this? In case of old infirm parents we do look after them but we must establish who is in charge. Often husbands side with their mothers. This causes a lot of conflict. When a husband stands up for his wife, it gives great security to the wife. Sometimes the in-laws try to dominate on other issues as well. · Financially: when you get married, you should be able to provide for your wife. Men must study hard, work hard and get a good job to be a good provider. When we take care of old parents, we need to treat both the in-laws equally. It is primarily the husband's responsibility to provide for his family. · Emotionally: Whenever there is a problem, we are not running back to dad and mum. In all this we honor our parents but we are separate. Remember your first priority is not your mother or sister, but your WIFE. · Spiritually: Now the husband must lead the home spiritually. So men, build yourselves up in the faith. Even how you bring up your children is the responsibility of the parents and not the grandparents. Men must be able to lead their wives spiritually. When we follow this ( and this is one only part of the ingredient for a successful marriage) there will be harmony all around. You will have a strong marriage and relationships with both the in-laws intact.